From crunchy seafood to chicken dipped in medley of sauces to an array of desserts, the South Asian country has everything to tickle the taste buds of travellers who love to eat. A gastronomic journey is a travel through a legacy of taste. The juxtaposition of culture and history creates a flavour that stays on the palate for some time to come. While heading to the islands of Indonesia in the South China Sea, eating the Nasi Goreng should be the last thing on anyone’s mind. Here is a journey that will take one from the volcanoes of Lake Toba to the highlands of North Sulawesi and from deep within Javanese territory to the Hindu-dominated Ubud. 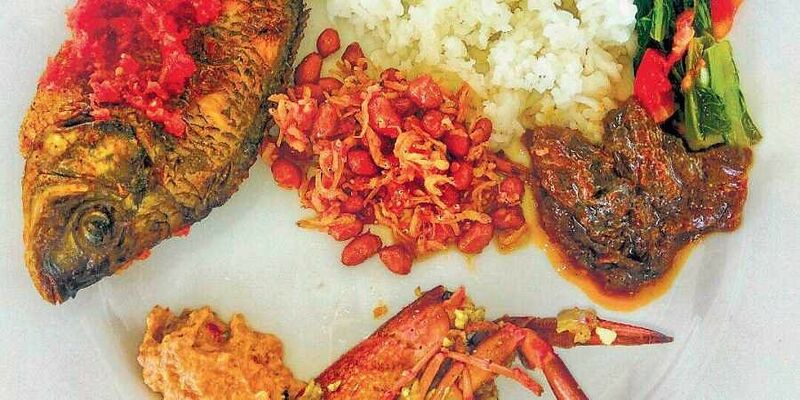 Although South Asian food had made quite a significant dent in the eating scene of Delhi, Indonesian food is far from recognisable for the Indian palate. The best idea is to start off the gastronomic journey in the volcanic mountain ranges of Northern Sumatra. As one traverses over the ridge from the airport, the vast blue expanse of the Lake Toba breaks through. The sun slowly setting on the horizon streaking the sky with orange is the perfect setting for a meal at the TB Silalahi Center Museum. This modern building complex is at odds with its surroundings as it holds the remnants of one of the oldest tribes of Indonesia, the Bataks. The museum at the TB Silalahi Center is tasked with preserving the cultural aspect of the Bataks. But it also hosts a restaurant that celebrates the indigenous food. One of the definite try-outs includes the seafood platters, which are quite famous here. It consists of giant lobsters and small fishes, the likes of which aren’t found anywhere else. The small fish crunches effortlessly across the palate as the taste of the giant lobsters will make anyone go into a stupor. While Northern Sumatra’s seafood tickles one’s taste buds, Central Java almost transports one back to the medieval era. The place is replete with hues of aristocracy in the form of Keraton Kasunanan (palace of the Pakuwubono kings) and Pura Mangkunegaran (palace of the Mangkunegara kings). Neatly tucked into a corner of Ngarsopuro night market is the Omah Sinten restaurant where a famous Javanese dish has made its name as the dish that represents Central Java. People can be seen sitting outside and gossiping over bowls of chicken. The modern restaurant is a cornucopia of activity as a group of young professionals will sit down for a meal with you. With sleeves rolled up and ties tucked away neatly, they dig into the chicken feet with alarming speed. The feet have been broiled for over six hours before being dipped into a medley of sauces. It imbibes the best flavours of Java. Ubud will definitely catch the fancy of people who are either Hindus or are in love with their culture. One of the specialities of this island is the Crispy Duck (Bebek Goreng in local Bahasi). Cooked as a whole, the baby duck is first boiled before being deep-fried until the outer skin becomes crispy while the inside remains succulent. Very akin to the Pecking Duck found all over the world, sprinkle some sugar over the duck skin to give it a flavour of its own. The duck is accompanied with the omnipresent Sambal and some greens to cut across the oily duck. A visit to the much-famed caves of Tana Toraja is not complete without a meal at Sallebayu restaurant. Located in the middle of paddy fields on all sides, a cool air drifts in as the Beef Rendang is served. Cooked in a mildly flavoured curry which had quite a few red chillies on top and sambal on the side, this dish is best enjoyed with steamed rice. Being an Indian, one can probably never have enough dessert and find quite a few favourites here. Deep-fried bananas, very similar to Kerala’s Banana chips sprinkled with a dose of sugar and cinnamon powder, is an explosion of sweetness. The unique taste of Indonesian food is what one needs to experience on a visit to the Island nation.